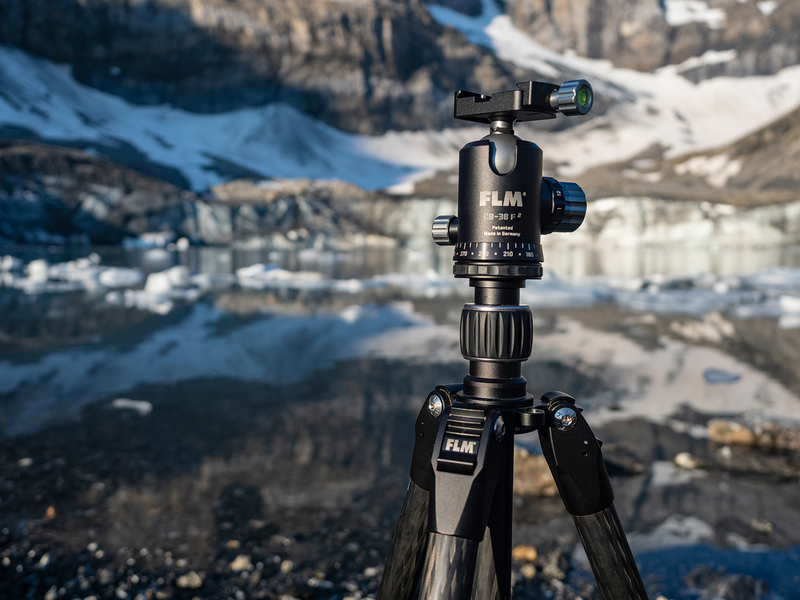 After having had the experience to work with FLM tripods for over a year now, and taking my trusty CP30 with its sturdy CB-48 FTR ball head onto several hikes, I decided I wanted to try one of their traveler tripods. 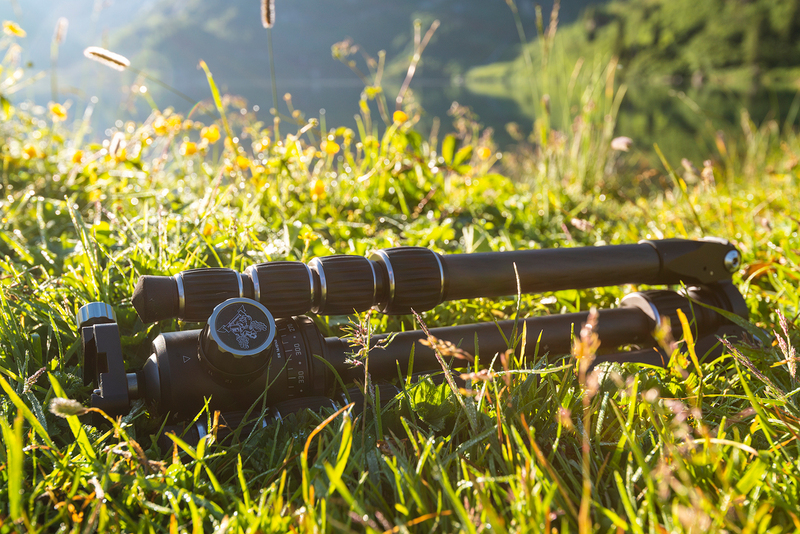 The CP 26 Traveler is advertised by the company as small and versatile lightweight tripod. Part of my intent was to minimize the weight I would have to carry on my back up the mountains on this year’s annual alpine hike with my friend Philipp Lutz. After getting a new backpack, new tent, and other gear the new, lighter tripod was the icing on the cake. My regular setup comes in at around 2,3kg, and whilst still being practical for hiking, less to schlepp is always a good idea. After talking to my contact, FLM supplied me with a CP 26 Traveler combined with the CB-38F II ball head joined by a Arca Swiss compatible SRB 40 base plate. This combination has a combined weight of around 1,7kg; 1280g for the legs and about 410g for the ball head. That’s a good 600g less than what I am usually attaching to my backpack. 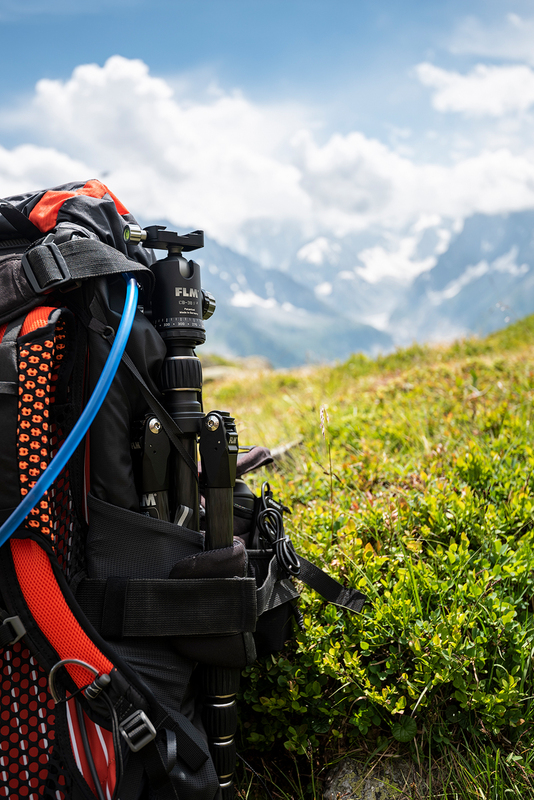 Now, this may not seem much for some, but if you carry that rucksack for hours on end up mountain slopes every little bit counts. Usually however, and I bet this is the first thing that comes to mind for many when thinking about getting a travel tripod, is what compromises you must make in terms of size and stability. So I will start with the CP26 legs. Whilst it is smaller than its larger siblings even with extended center column, I was surprised at its base height of approximately 120cm. 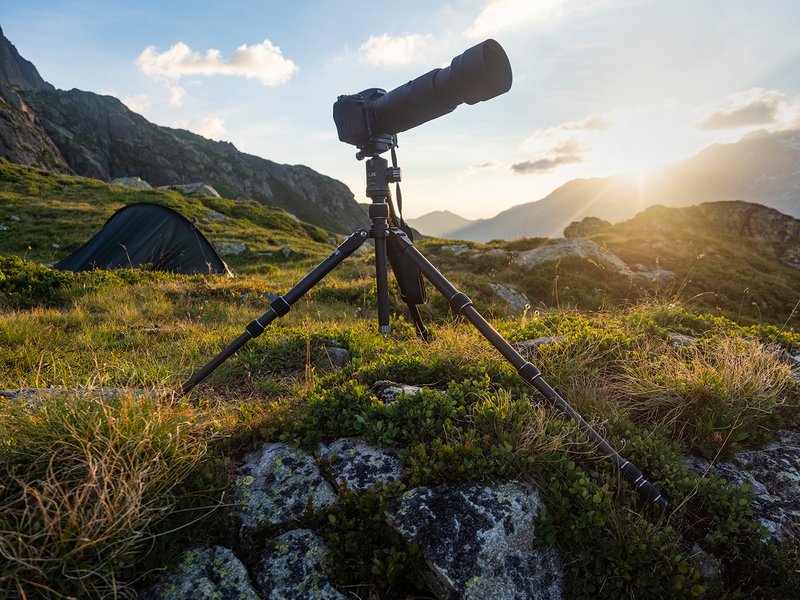 It may not get you over certain fences at the edge of a cliff or a railing at a popular viewpoint, but that is not what travel tripods are designed to do. They are designed to get you to where there are no railings or fences anymore by giving you the feeling as if you weren’t carrying additional weight around. I used the center column several times during my test which got me to around 160cm which is a height I can fairly well work with, even though I am over 190cm tall. The camera usually gives me around 8cm of extra height (to the viewfinder) and the ball head also adds another 10cm so it all works out perfectly at around 180cm. Higher than any railing as well. As expected in windy conditions the extra bit of size is accompanied by a loss of stability as it would with any tripod. I tried shooting with my Tamron 100-400mm lens in winds and even with the stabilizer it is difficult to get shots to be sharp, then again, if you are shooting 400mm, most of the time you don’t need the size of the tripod, since perspectives over such distances barely change at 50cm of elevation anyway. So I simply lowered the column and was happily shooting away. A feature for those who never use the center column anyway: you can simply take the center column out which gives you an extra 150g of saved weight. Also if you shoot at ultra wide angle lengths camera shake isn’t nearly as noticeable, if barely at all. I usually am more of a ultra-wide angle, horizontal shooter, so having a low angle isn’t bad at all for me anyway. I almost never use the lower sections of the legs when I am in the mountains either. But I must hand it to FLM that at not point in time I had second thoughts when I had to use them to get a higher perspective. The legs were always stable and do feel reliable and sturdy, even the lower elements. They may not withstand gale force winds or standing in a rushing mountain stream, but for all other applications they are absolutely a great option. For all who are pixel peepers and have to shoot in windy conditions with Pixel Shift or 40+ MPx simply retracting the lowest and thinnest part of the legs is your best bet to make sure everything is 100% stable and still end up at around 125cm in total with ball head and camera. 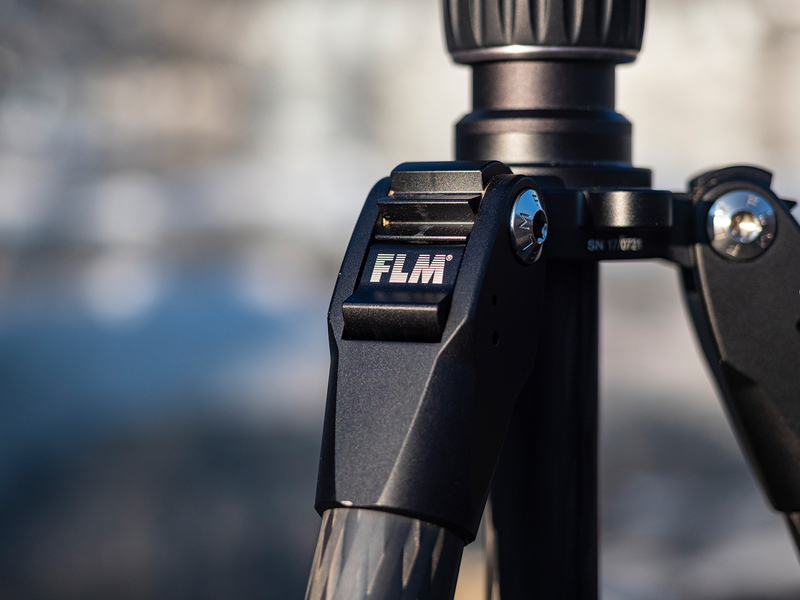 Then again after using other brand’s travel tripods I can safely say that the FLM CP 26 Traveler was by far the most stable set of legs I’ve used so far. The 10 layers of carbon might be one of the reasons why it seems to be a bit better in fending off vibration compared to other travel tripods with only 6 layers. If there was a version with only four leg segments instead of five I would however prefer that since the compact size isn’t as important for me as is the load. One thing in particular that I like is the locking mechanism for changing the leg’s angle. FLM again applied their trademark design. You press it and then adjust the angle and when pressed again it will then clamp back into place in three different angles. After using this mechanism for a year on my other tripod and only having to readjust the screws twice with a simple allen key I do really like it. The build quality of the knobs is as outstanding as I am used to with FLM, taking only about a quarter of a turn to loosen or tighten. This makes the tripod extremely quick to extend and shorten. The locking mechanisms feel solid and only seldom did I miss to tighten one of them by mistake when working in the field – something that can happen in the heat of the moment when every second counts. The rubber grips feel valuable and are a pleasure to use. Due to the size of the rubber feet there are no retractable spikes built in as with the CP30 and other models, which is logical, but took some adjusting to since now the only option is to take off the rubber feet and screw in the spikes by hand. Since I didn’t want to carry around the extra piece of equipment I found myself not using the spikes most of the time, even though there were at least two situations where I was shooting and I might have needed them. Whilst this might not be as practical, it is good to have the option when you’re traveling and intend to shoot coastlines or steep slopes. When fully collapsed and with its legs inverted the CP 26 Traveler is only around 40cm and thus as practical in terms of space as tripods can get. I usually carry it around on my rucksack, but I can also easily attach it to my Inverse 200 if need be. It’s interesting to see how something so small and light can unfold into a tripod that doesn’t evoke the feeling that there is too much of a compromise for the lighter load. Now let’s take a look at the ball head. The small CB-38F II ball head is just as well crafted as the legs and has a haptic that is delighting to work with. Even after having the CB-48 FTR , the most advanced ball head FLM offers, for about a year now I didn’t find myself nagging about anything. Using the knobs is just as effortless as I am used to. Adjusting the friction of the ball head with two simple turns and loosening or tightening the base plate for X-axis movement feels intuitive and frankly speaking I didn’t pay much attention to it because it is so uncomplicated you don’t have to think about it in the first place. This is one of the best compliments I can think off. Its maximum load is stated as 25kg and while I usually think these numbers are a bit over the top I somehow believe it in this case, having had it in my hand and working with it. Even with the Tamron 100-400mm and my D750 attached, the friction setting – no matter if set high or low – always behaved as expected and helped me to control the speed of movement needed to shoot either landscapes, ibex, or birds in flight. I love setting the friction high so that the ball head only moves when I work it, but doesn’t when I’m not. Having the camera at a decline angle with weight dragging on the ball head but it simply not moving and then changing the angle with a bit of applied pressure is blissful. It gives me perfect control over my compositional setup the way I am used to. All in all the CP 26 Traveler feels like many of its bigger brothers in terms of solidity and craftsmanship whilst having more versatility due to it being lighter and smaller. I would assume that the only downside I could name is that this amount of quality has a price, then again you get great service and warranty, and I would imagine that it lasts for quite some years even with under heavy abuse. I just wish I could’ve kept it for my next hiking trips because I already grew fond of it, and I do say that as someone who always preferred the beefy, heavy tripods. 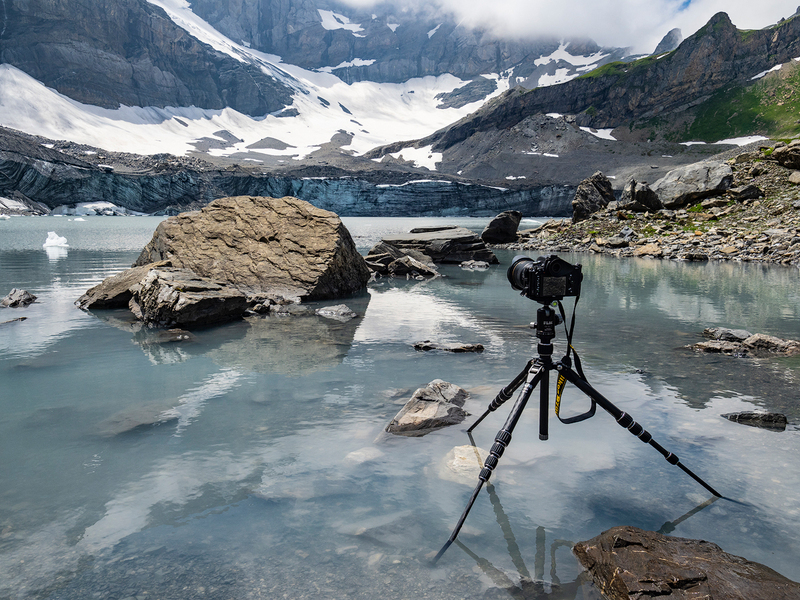 I doubt anyone else would be so dumb to carry around 3,7kg tripods into the high Alps. I did. Fortunately, I won’t again since with my FLM, tripods I don’t have to anymore. You can find my experiences with the FLM CP30 M4S and the CB38-FTR here.